The last day or so, I was trying to figure out what not to write about the iPad. Would I not write that it was like an iPod/iPhone, only bigger? Would I not write that it should have had handwriting recognition, video recording, or a webcam? Or would I not write that it has no chance of lasting the 10 hour reported battery life, as we all know from MBP and iPhone experience? And then it hit me. I think we’re looking at a new type of computing. 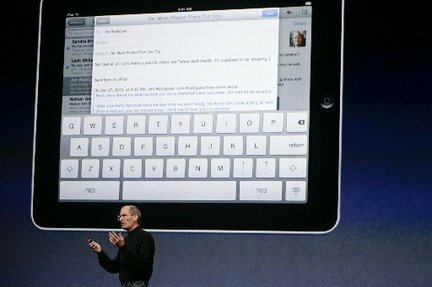 iPad doesn’t replace or substitute existing computing paradigms. It’s true that yeah, “it’s kind of like an iPod”, and “a little like a netbook”, and “sort of a media player and a book reader” but that doesn’t really describe the change in consumer behavior that’s likely to happen when you have one of these babies in your hot little hands. What Jobs has done is given us a portal to buy things, made the screen big enough for everyone to see, and opened up the floodgates so that we can not only buy DRM-able media, but also mini applications, a la carte Cable Television series, and perhaps even live streaming of Sporting events. So forget Apple TV and the Cube. The iPad isn’t going to be a failure — it’s going to be a rollicking success that is going to leave us wondering how we ever lived without it. And by the way – if you are among the 75 million people who already own an iPod, iPod touch or an iPhone, you already know how to use it — and so the greatest pain of user adoption is going to be figuring out how you can hold the iPad in one hand and take out your wallet with the other. Let the games, the gaming, and the gamesmanship begin. Previous Post Has Twitter Subscriber Growth Peaked? Greg, I think you’re exactly right. The iPod was evolutionary rather than revolutionary in that there were plenty of other portable MP3 players already on the market. Apple nailed the combination of a simple, intuitive UI and product design (as usual) with the ease of buying new tracks on iTunes with the click of a mouse, and reinvented the whole way we consume music. Although the iPad itself is underwhelming as a device, we shouldn’t be surprised to see it do something similar in publishing, commerce, or other areas.